The cycling legacy of the 2012 Olympics became clearer on Wednesday night as proposals for London’s VeloPark were given the go ahead. Submitted by the Olympic Park Legacy Company (OPLC), the application received unanimous support from the Olympic Delivery Authority’s Planning Committee at a meeting in Stratford’s Old Town Hall. British Cycling and Sport England were among the bodies who also supported the designs, while members of the Eastway Users’ Group were also consulted on the proposals. * A one-mile road circuit with the Velodrome as its focal point. * Five miles of MTB trails with trails of easy, medium and hard difficulty. * Various cyclo-cross provision, including a suggest 1.5-mile course incorporating the road circuit. The VeloPark will be built on the former Eastway site, and former users of that facility have played an active role in ensuring that the Games provides them with a fit and proper replacement in legacy. However, the EUG managed to get the Planning Committee to agree to inserting new conditions in regards to Event Management plans for the VeloPark, after raising concerns about shared pathways, racing along rights-of-way and public being able to stray into a race area. Once built, the OPLC are hopeful of handing the VeloPark over to the Lee Valley Regional Park Authority (LVRPA) by the end of 2013. For more reaction to the planning approval, see next week’s Cycling Weekly (March 8 issue). 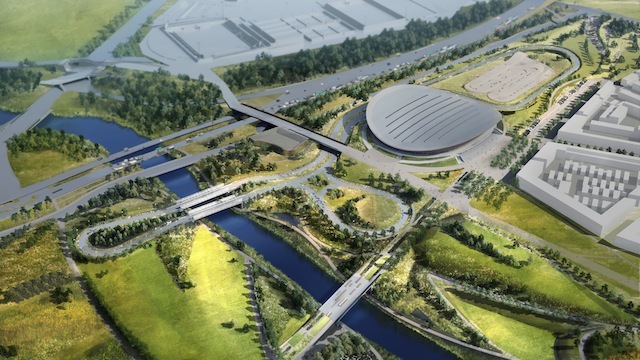 VeloPark: Last chance to have your say? The VeloPark viewed from the south west; the one-mile road circuit is situated around the Velodrome.